You would have most recently seen and heard of a black hole in Christopher Nolan’s hit movie Interstellar, and felt like a nasty bouncer above the head? Well, there is a simple explanation of what black holes are and how do they exist. Imagine a massive celestial object in space, so densely packed with matter that nothing can ever escape it, not even light- that’s what black holes are. They are formed by large stars- stars that are way larger in size (20 times or more) than the sun. When such massive stars run out of fuel in its course, it can no longer sustain its heavy weight. They rapidly collapse causing colossal of explosions called a supernova. The dense core of the star continues to remain bound together by the force of gravity and pressures from the star’s outer layers continue to collapse inwards because of its weight. These particles continue to be squashed together and the star becomes smaller and smaller until all that is left is a black hole. This object is so dense that even light cannot escape it and is expected to be spinning. Due to the spinning nature and strong gravity, they drag the space around them just like honey drags along a spinning spoon. We can see an object only when light bounces from it, but since black holes don't let light escape, they appear black - hence the name. Singularity is the name given to the tiny gravitational center in a black hole, which is incredibly dense, think of it as the nucleus of an atom. Around the Singularity, there is a region from which light is not able to escape and is sucked in. The edge of this region is called event horizon. Outside of this event horizon, matter and light will still be sucked in but they can be seen and they appear like Saturn rings spiraling in - think of water spiraling in the sink hole - instead of rings, this region is called accretion disk (accretion means gathering). So if we cannot "see" a black hole, how do we know that they exist? Well, just like planets revolve around the sun due to sun's gravity, similarly, when celestial objects are seen revolving around an invisible center, a black hole is spotted. Many scientists from the 17th century have tried to prove the existence of black holes but it was only in the 1970s when Stephen Hawking proved that black holes must exist. 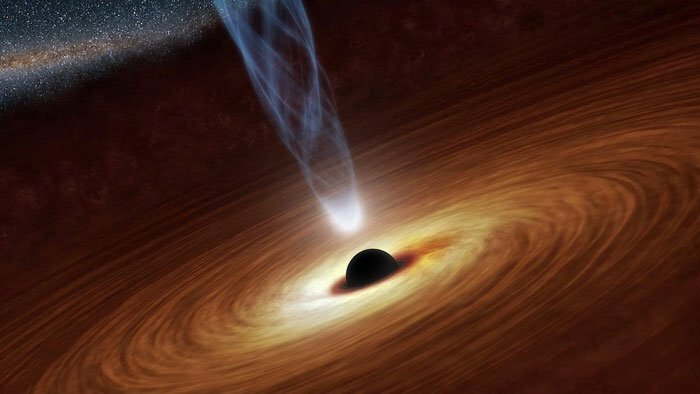 Recent studies prove that black holes exist, generating a lot of fascination and mystery around this subject matter. Scientists once thought black holes came in only small and large sizes, but recent research has revealed the possibility of the existence of midsize, or intermediate, black holes (IMBHs). Such bodies could form when stars in a cluster collide in a chain reaction. Several of this forming in the same region could eventually fall together in the center of a galaxy and create a supermassive black hole. In 2014, astronomers found what appeared to be an intermediate-mass black hole in the arm of a spiral galaxy. Black holes are incredibly massive but cover only a small region. Because of the relationship between mass and gravity, this means they have an extremely powerful gravitational force. Virtually nothing can escape from them — under classical physics, even light is trapped by a black hole. Such a strong pull creates an observational problem when it comes to black holes — scientists can't "see" them the way they can see stars and other objects in space. Instead, scientists must rely on the radiation that is emitted as dust and gas are drawn into the dense creatures. Supermassive black holes, lying in the center of a galaxy, may find themselves shrouded by the dust and gas thick around them, which can block the tell-tale emissions. Sometimes as a matter is drawn toward a black hole, it ricochets off of the event horizon and is hurled outward, rather than being tugged into the maw. Bright jets of material traveling at near-relativistic speeds are created. Although the black hole itself remains unseen, these powerful jets can be viewed from great distances. If a particle-antiparticle pair is created just beyond the reach of the event horizon of a black hole, it is possible to have one drawn into the black hole itself while the other is ejected. The result is that the event horizon of the black hole has been reduced and black holes can decay, a process that is rejected under classical mechanics.